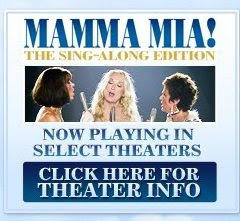 Just as I predicted when the movie first appeared, special screenings of Mama Mia! the Sing-Along Edition will be held in theaters across the US this weekend. Like the Sound of Music, Mama Mia! just begs for dress up too. Check the official website for listings and have a very musical Labor Day weekend. You don't know what to wear to the Sing-Along? May I suggest the following clip for inspiration. Bonus - it's Waterloo sung in French with an introduction in Swedish!